Pictured L to R: Shyann Bootman, Peyton Stavrou, Marie Bogue, Kara Barcher, Rylie Sorce, Ronan Kreshik. 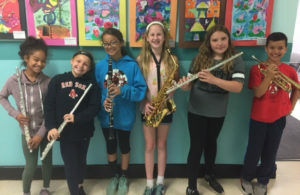 Six Bell Top fifth grade band members performed at the New York State School Music Association (NYSSMA) solo festival at Shaker Junior High School on Friday, June 1. Shyann Bootman, Peyton Stavrou, Marie Bogue, Kara Barcher, Rylie Sorce, and Ronan Kreshik earned either “Excellent” or “Outstanding” ratings for their performances.